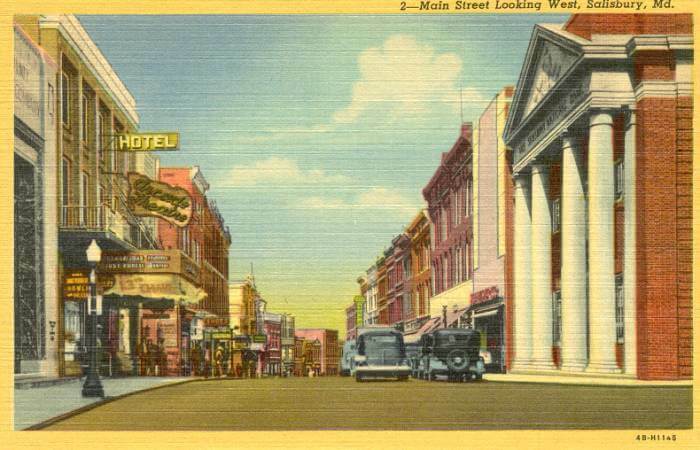 Guide to Salisbury, Maryland - "The Crossroads of Delmarva"
A postcard depicting Salisbury’s Main Street in 1920. 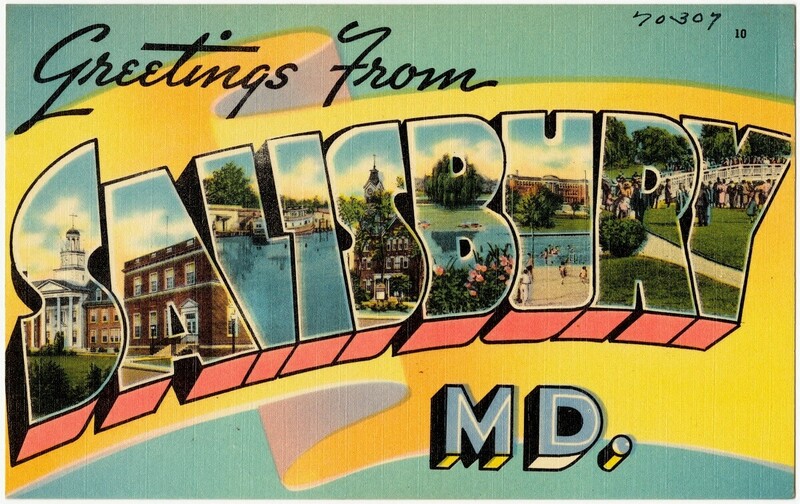 Salisbury (which you might often see stylized as just “Sby”), first just a small colonial outpost designated by Lord Baltimore, was established as a city in 1732, due in part to its location at the head of the Wicomico River that made the region convenient for trade. It’s thought that the city’s name is borrowed from the ancient cathedral city of Salisbury, England, because of the two cities’ physical characteristics and the nationality of its founders. During the Civil War, Union forces set up camp in the city to search for Confederate sympathizers and prevent the movement of contraband to the southern army. In 1860 and 1866, disaster struck when fires burned through and destroyed two-thirds of the town. Still, the city was able to build itself back up, and remained strong throughout the 19th and 20th centuries; during the Great Depression, Salisbury continued to grow in commercial business and industry and avoided much of the poverty that the rest of the country faced. In the early 1950s, the city expanded more as the Chesapeake Bay Bridge was built and brought on an onslaught of tourists and non-agricultural business investments. 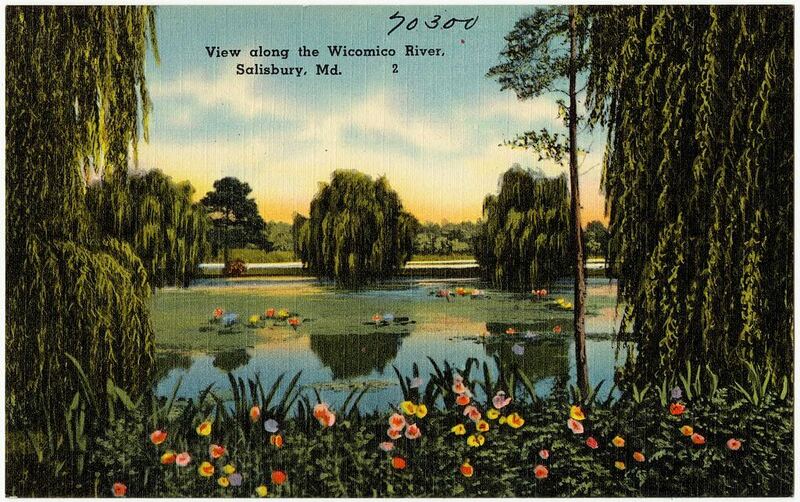 When Wicomico County was formed out of parts of Worcester and Somerset Counties in 1867, Salisbury became the government seat, which it remains to this day. Despite the fires that unfortunately maimed many of the city’s 19th century colonial structures, several centuries-old buildings remain standing today and are listed on the National Register of Historic Places. History enthusiasts, take note! The Gillis-Grier House: A historic home that was built in 1887 which features gorgeous Queen Anne style architecture, including gable-front elevations, a three-story octagonal tower and a service wing. Honeysuckle Lodge: Another historic home, the Honeysuckle Lodge was built in the early 20th century and features Colonial Revival style architecture, as well as a guest house on the property that was built in 1940. The Perry-Cooper House: A three-story frame dwelling built in 1880, named for local civil leader Thomas Perry, who occupied the house from 1897 to 1950. Poplar Hill Mansion: A historic U.S. mansion currently open to the public as a house museum, Poplar Hill was built in 1795, has changed hands many times over the centuries and is thought to be inhabited by the ghost of a young once-enslaved girl named Sara. Union Station: Constructed in 1913, the historic railway station was once the most elaborate passenger facility on the Eastern Shore. The structure became a freight facility in the 1950s and was added to the National Registry of Historic Places in 2007. F. Leonard Wailes Law Office: The law office across from the Wicomico County Courthouse dates back to 1927, and was built in the Colonial Revival architectural style. In case visiting all of the historic homes and structures in Salisbury isn’t your cup of tea, there’s a litany of other activities to keep you busy–here are just some of Salisbury’s well-traveled destinations and things-to-do. The Salisbury Zoo is the only zoo on Delmarva, and it’s completely free to the public (although donations are always accepted). At the zoo, you’ll find naturalistic enclosures for species native to North, South and Central America, as well as a “Beastro” for food and drink open seasonally and an Ocelot Spot Gift Shop. The Ward Museum of Wildfowl Art might sound like a pretty niche destination, but the Eastern Shore is known for its many and varied species of birds–especially ducks, geese and swans. The Ward Museum features local art and the world’s largest public collection of decorative and antique decoys. The Riverwalk downtown is another good place to see the local wildlife. The Eastern Shore is very much an up-and-coming craft beer destination and Salisbury is the very heart of the local craft beer scene. Take a tour and sample the hops from two of Salisbury’s very own microbreweries, Evolution Craft Brewing and Rubber Soul, or sample an abundance of local beer at the annual Shore Craft Beer Festival. In town during baseball season? Come out to a Shorebirds game! The local minor league team plays at Salisbury’s Arthur W. Perdue Stadium and is one of three Single-A affiliates of the Baltimore Orioles. Head downtown to shop, eat out and take in the scenery over the Riverwalk, a walking path along the Wicomico River that was completely revamped after receiving a $1.5 million makeover. Of course, you have to check out Salisbury’s thriving downtown, too. 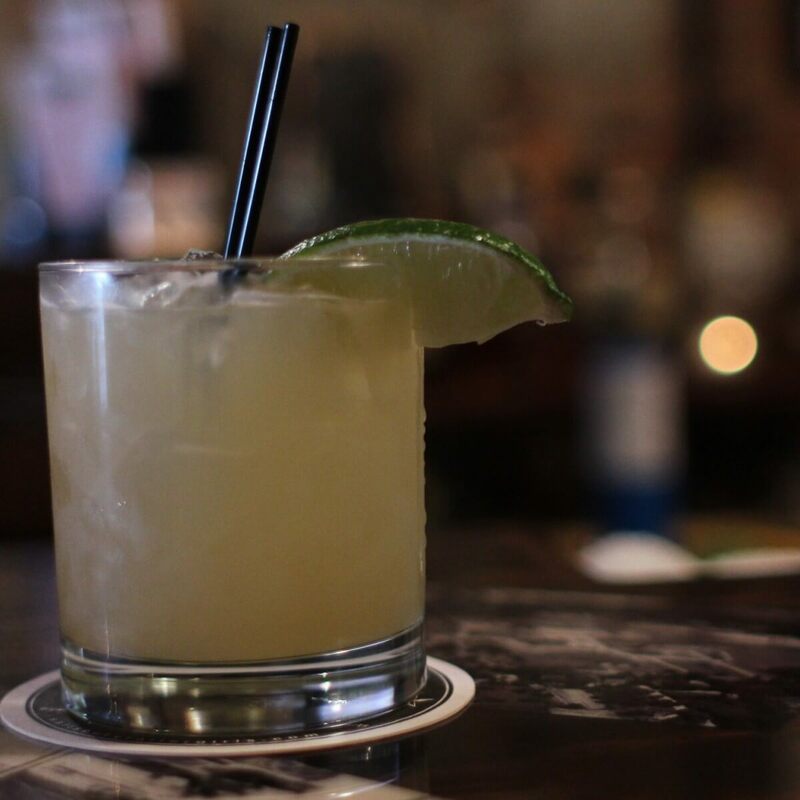 Visit an art gallery, do a little shopping or stop at a bar like the Brick Room for a beer (or a whiskey sour, pictured above). If you come to town on the right day, you’ll find that something interesting and probably really fun is happening in the city’s downtown area. Here are some of the weekly, monthly and annual events that you might just find yourself stumbling upon. 3rd Friday: On the third Friday of every summer month, you’ll find live music, children’s activities and vendors selling arts and crafts along the Plaza outside. In the winter, the party moves indoors to The Powell Building on Main Street. Fridays at Five: Fridays are clearly the night to be out in Salisbury–at 5 p.m. every Friday through September, there’s games, a beer garden and live entertainment at this family-friendly outdoor mixer. 1st Saturday: Recently added to the lineup of monthly happenings is 1st Saturday, a family-friendly musical celebration. Park and Flea: Buy, sell and trade your wares every Saturday and Sunday morning in the lot next to Season’s Best antique mall. There’s antiques, collectibles, yard sales, plants and even a Farmer’s Market on Saturdays in May through December. National Folk Festival: This one’s hot off the press! From 2018-2020, Salisbury will host the National Folk Festival, the country’s longest-running traditional arts event that features music, dance and other traditional arts and culture. Salisbury is the largest city on Maryland’s Eastern Shore, with a population of 30,343 as of the 2010 census. Another slogan for the city is “The Crossroads of Delmarva,” as Salisbury is center of the region’s culture and economy thanks in part to Salisbury University and large employers like Perdue Poultry. The city thrives when it comes to cultural events that take place downtown, as noted above, and is also a local hub for art–there are currently five galleries and art shops in town. Speaking of art, Salisbury is an official Arts and Entertainment District in Maryland as of 2007. A few persons of note with roots in Salisbury include Maryland’s longest-serving Senator Paul Sarbanes, poet Ogden Nash and of course Frank Perdue, founder of Perdue Farms. 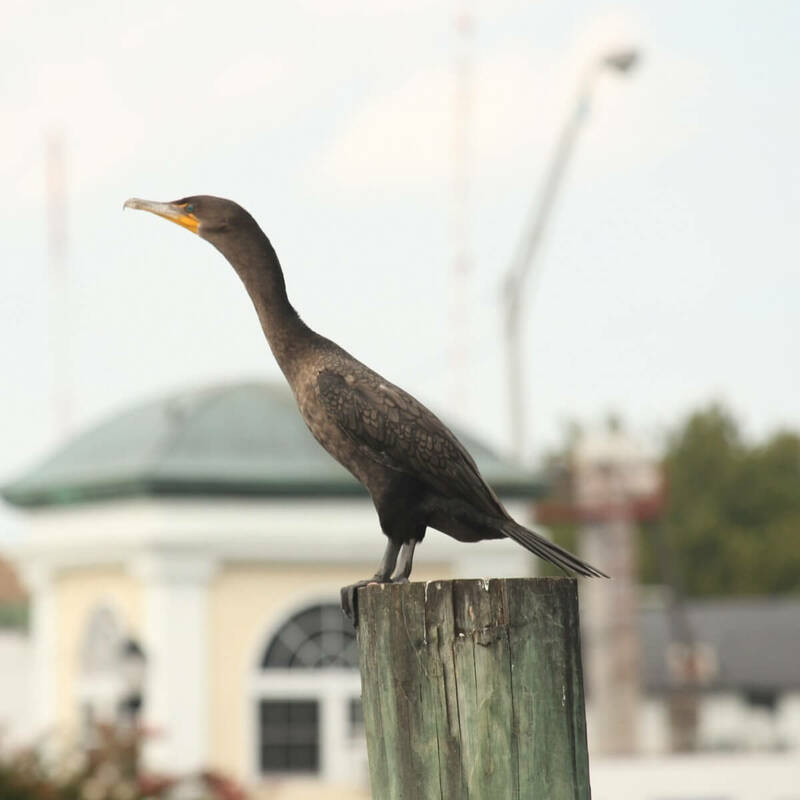 Take in all the views that the Wicomico River has to offer in Salisbury, Maryland.